The State Historical Society of Iowa is trying to get a better handle on Iowa’s place in the African-American civil rights movement. It’s setting out to locate properties that might help tell the story of this in-state struggle for equality. 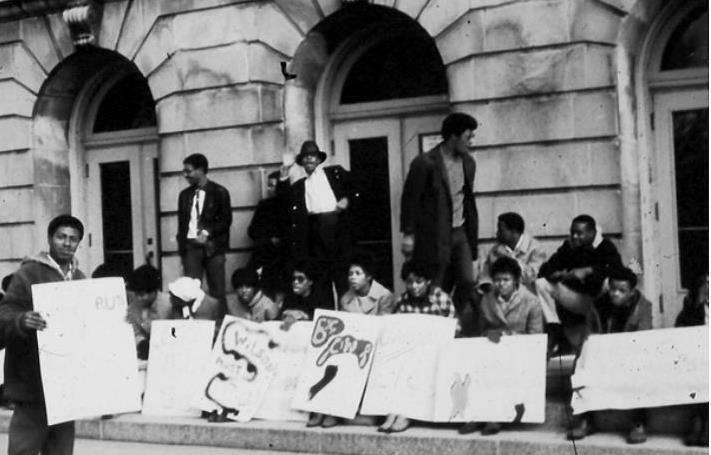 Students protest in front of Waterloo East High School in 1969 and successfully demanded black history be included in the curriculum and more black teachers and counselors be hired. Over the next two-and-a-half years, researchers will be looking for workplaces, churches, schools, neighborhoods, any public place where people were fighting for civil rights in Iowa during the 20th Century. An architectural historian with the Historical Society, Paula Mohr, says it’s difficult to know how many such places exist. “It’s not until we start digging into old newspapers and interviewing people who have memories of these properties that we’ll actually get a handle on where they are and how many of them survive,” Mohr says. Mohr says one goal is to identify at least one site that might qualify for a spot on the National Register of Historic Places. “One of the reasons we want to do this survey in the first place is this is an area of Iowa’s history that has really been neglected in the past,” she says. There are four locations connected to civil rights in Iowa on the National Register of Historic Places, including the building in downtown Des Moines that housed the Katz Drug Store where Edna Griffin led a sit-in to end segregation. The Historical Society is using a federal grant to fund the survey.